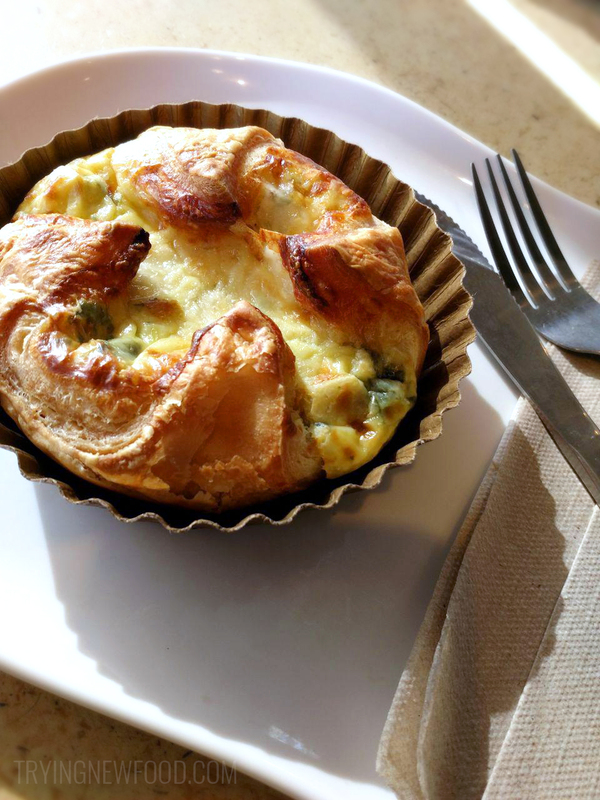 It tasted very similar to the other soufflés with the flaky pastry and cheesy egg center. The egg isn’t overcooked, and there’s a good egg to cheese ratio. The whole thing reminded me of the Spinach & Bacon soufflé, but with cubes of artichoke instead of bacon (which it’s probably exactly that). I thought the artichoke would’ve been more incorporated, and not in little cubes. It kind of took me out of the experience of savoring my soufflé. I would pick either the Four Cheese or the Spinach & Bacon flavor next time. Calorie-wise, the Spinach & Bacon comes in the highest at 550 calories, followed by Spinach & Artichoke (520 cal), Ham & Swiss (450 cal), and the lowest is Four Cheese with 410 calories. Since eating one of these is always a special treat, the calories don’t really influence my decision. I am just aware throughout the day that I’ve already had 1/3 of my daily calories. That way I don’t overeat during lunch and dinner. I highly recommend Panera soufflés, just maybe not this specific flavor. Unless you’re obsessed with artichokes and adore them in tiny, cubed form. I liked Spinach & Artichoke for everything except the artichoke in it. My suggestion: you can’t go wrong with their Four Cheese soufflé.